I'm interested in taking more close up images of the Moon with my ZWO planetary camera. With a four micron sensor element pitch I've found that I get the best resolution adding a Barlow lens ahead of the camera coupling. This magnifies the image spreading out the light cone. This works great for images of small planets. With a big bright target like the Moon, I usually have visible light flares on the image. I can sometimes minimize these careful composition, but I want a better solution. 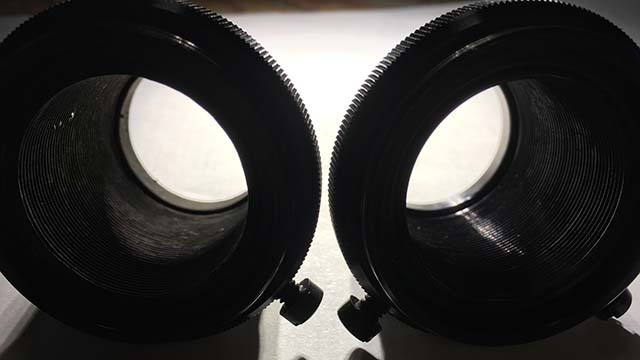 The Questar swivel camera coupling is anodized black aluminum with ridges to minimize reflections. When I point the camera coupling near a bright light, I can see a bright streak of reflections from the tops of the ridges. It appears that with the large bright Moon as a target the Barlow is spreading moonlight so that it hits the sides of the camera coupling. I believe that the reflection from the tops of the light trapping ridges is the cause of my light flares. I've decided to try two approaches to mitigating the problem. One is to place the Barlow after the swivel and use a longer extension tube. This approach increases the difference between the settings for best eyepiece focus and the camera focus. It also makes it less convenient to use two stacked Barlows. I've also decided to try coating the interior of the camera coupling with a paint less reflective than the anodized aluminum. Artists have a shared interest in very dark black paints with astronomers. I decided to try Stuart Semple's super black, super flat, ultra-pigmented acrylic paint. I have two camera couplings and have painted the interior of one so that I can compare the results. The image shows that the paint eliminates the brightest reflection. The rougher surface of the paint seems to pick up a bit more light in other areas. I'm not sure if this will be an overall improvement, but the proof will be in the images. I'll report on the results when I have them.